Bluetooth MightySat!! No taxes, free shipping!! 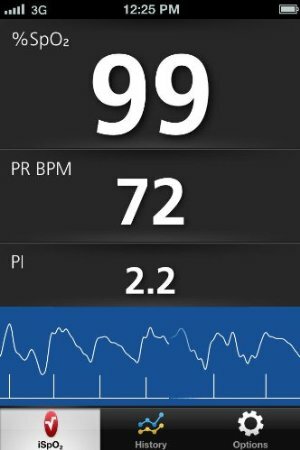 Turn your Apple or Android Device into a Recording Pulse Oximeter!! Updated Version with Respiration Rate RRp in stock!!! With the free Masimo MightySat application, you can graphically view your SpO2 and PR measurement history over time and share that data through email. Measures oxygen saturation and pulse rate during movement, even under challenging situations such as low blood flow to the finger. Color display gives readings and graphs to monitor trending over time. Ability to export data history into .CSV (comma separated values) files for use with text editing and spreadsheet programs such as Microsoft Excel. Very happy with the device. Sync worked perfectly with my android phone with little to no setup required. The item was shipped promptly, great packaging and no issues on delivery. Overall amazing product, and really smooth purchase. Would recommend 100% to another person. I have purchased and retuned enough finger oximeters to know that you get what you pay for. I need to monito and track my O2 levels while I'm on my treadmill and gym bike. this is the only unit that doesn't drop readings. Highly recommend it for others in the same situation!! Nothing works on me except this unit. Can track my vitals. Worth the investment.